The Elliptical machine has become extremely popular thanks to its unique capability to offer low-impact exercise while simultaneously working for multiple muscle groups. Ellipticals are considered one of the best pieces of fitness equipment for losing weight too. They help you to burn more calories and also increase your cardiovascular capacity. If you are serious about losing weight and getting in shape, an elliptical trainer is exactly what you need. The following section covers the various price bands you will find for the most popular ellipticals on the market. We have reviewed each extensively and present both the pros and the cons so that you can make an informed choice as to which machine is right for you. 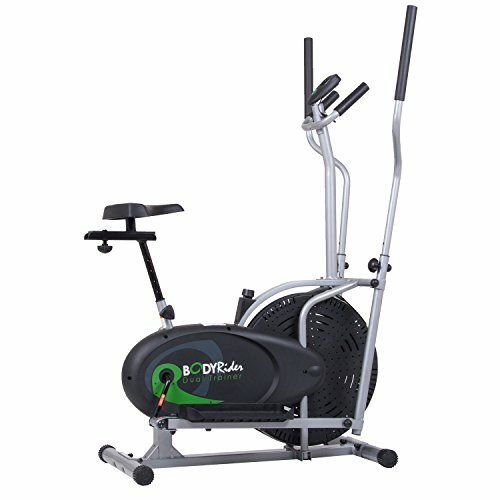 This machine has a 250-pound capacity and functions as a 2-in-1 elliptical trainer and exercise bike. 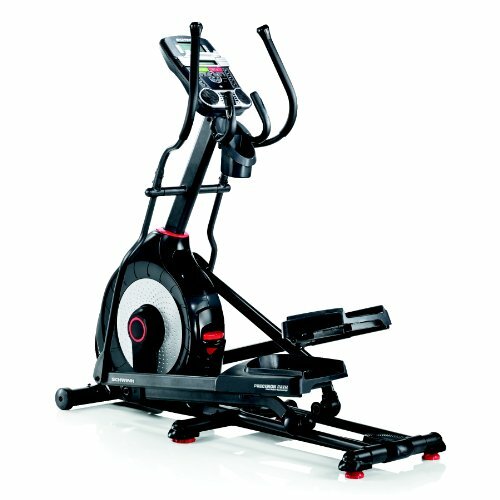 It is one of the least expensive full elliptical machines on the market. The machine comes with a built-in four-function onboard computer that tracks time, speed, distance, and calories burned for a more effective workout. The seat is adjustable, allowing for users to customize it to their height and comfort. The adjustable seat also allows users to customize their workouts to be done while standing or sitting, shifting to a standing or upright exercise bike if desired. The trainer function of the machine can move backward or forward depending on a user’s desired workout. Workouts on the machine are low impact thanks to the natural elliptical motion in footpads and arm poles, meaning there is less stress on the joints. It is suitable for all levels of ability and skill. Its compact size does not take up too much space. Despite arriving with tools and instructions, the machine can be difficult to set up, and if not done properly, parts can fall off and the machine will perform poorly. If parts do become loose within the machine, users will have to fully disassemble it to perform tightening or maintenance. At faster speeds, the machine becomes unstable and shaky. After a while of use, the machine is known to become noisy. The seat is hard, making it uncomfortable when used for long periods of time. Overall, the machine is not the most durable of options, and depending on the way it is used, some models last for a year at maximum. This small trainer stands out from the other elliptical machines on its list in nature, as it consists of a footpad-only chassis. It is one of the highest best sellers of these machines in the market and comes in three color options. The trainer has a lightweight and compact design, and as such, it can be set up and used anywhere, from under the table at an office to in the corner of a room at home. Its small size makes it fully portable and easy to store. It can be used to exercise at any time at all – when watching television, working at a desk, during a fully engaged workout, and more – and users can choose between standing and sitting exercise. The trainer is designed for low impact exercise, protecting the joint, knees, ankles, hips, and back from injury. A monitor keeps track of time, calories burned and strides made for a more effective workout and to track your progress. The tension of the machine is adjustable via a knob so the user can customize your difficulty, and users can set it for backward or forward motion as they desire. Non-slip, textured pedals make exercise safer and easier. This product is highly durable and sturdy due to its steel construction. The trainer is silent, allowing you to focus on other work while you exercise. 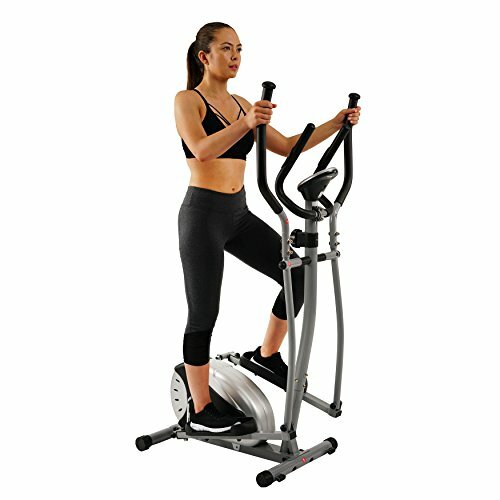 Standing workouts in this trainer may be unsafe due to the lack of features you can use to balance yourself with, and the machine may become unstable with standing exercise. 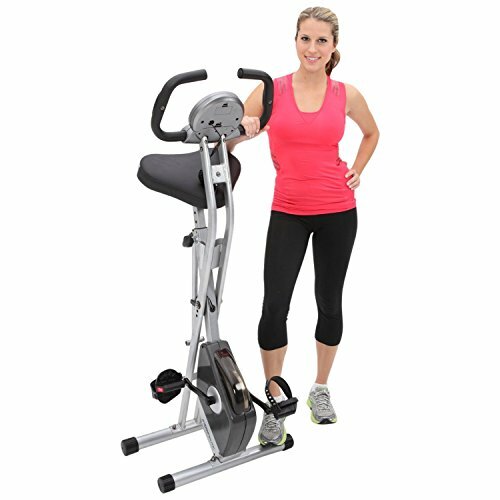 The machine has been noted to not be durable for standing workouts, as it has low weight restrictions and extra mass can break off its pedals. The trainer requires a significant amount of maintenance in order for it to last for a long time. It's small stride length can feel uncomfortable or awkward to users, and restricts the range of motion. It occasionally jolts during usage, preventing a completely smooth glide of the pedals. Larger or taller users may face difficulties with the product due to its small size; the foot pedals do not fit large feet. This elliptical is designed for those on a budget with limited space to spare. It can support up to 220 lbs and has an LCD display monitor. The compact design can fit into small areas and can be moved and stored easily. It comes with transportation wheels in the front for painless movement and adjustment of the machine. The natural motions of the machine provide a low impact workout for joints. It provides a good lower and upper body workout, thanks to dual arm poles that move in time with the foot pedals. The machine makes use of strap resistance in order to create more challenging workouts. This is adjustable via a dial. The machine’s tension is fully adjustable for all workout types and to cater to a variety of skill levels. The large pedals are suitable even for users with bigger feet, and they come with ridges to prevent slips and injury. An easy-to-read display monitor shows you distance, time, speed, and calories burned so users can see their progress. The product requires regular maintenance in order for it to last long; a lack of tightening loose screws and check-ups can result in it breaking within a year. The foot pedals run on a slightly downward incline that can be uncomfortable for users and cause foot pain if used for a long period of time without rest. The assembly can be complicated and take a couple of hours. Depending on the floor that the machine is used on, it can run noisily or choppily, getting in the way of a desired smooth exercise session. Stride length is slightly shorter than most other elliptical machines, which can be uncomfortable or feel like less of a workout for experienced users. Heavier users may notice that it wobbles or is slightly unsteady while they are using it. Shorter users may find that the arm poles are at an uncomfortable distance. It is designed to be able to be accommodate users of any size, with a large seat cushion that can be adjusted to suit those between 5’3” and 6’1”. Its compact and lightweight design allows for easy movement, and it is foldable for easy storage. The product is designed with an eight-level control system for its specialized Magnetic Tension for customizable difficulty on all workouts. A “high torque” 3-piece crank system ensures a smooth and consistent pedal during all workouts. It is built with leg stabilizers that extend in order to prevent unstable tipping or moving during workouts. Meanwhile, large foot pedals have a safety strap that is inbuilt to prevent injury or slipping. It comes with a “double drive” transmission system to assist during exercise. Apart from the usual records of time, distance, speed, and calories burnt, the LCD display computer also keeps track of a user’s heart rate and pulse. It is silent when running due to a V-belt drive and a precision balanced flywheel. The machine comes with a limited one year warranty. The large seat may be too wide for certain users. The placement of the pedals on this machine are slightly forward, making the bicycle not entirely an upright bike, which may cause stress on a user’s back due to the lack of a backrest. The pedals are not of the most durable material, and constant high-intensity workouts may wear them thin. Regular maintenance is needed to tighten screws and keep the machine up and running in its most effective manner. The digital readouts of burned calories are not 100% accurate. Higher resistance settings generally lead to slightly louder performances from the machine. Customer support with the Exerpeutic company is known to not be of the best or highest standard. The product has high-momentum fan blades built in to it that provide a light breeze during exercise. The seat is adjustable, both vertically and horizontally, in order to accommodate a wide variety of body specifications and measurements. Time, speed, distance, and burned calories are tracked on the electronic console for a more effective training session. The tension is adjustable via a simple to use knob, allowing you to customize your workouts. The machine keeps in mind low impact exercise to reduce joint and knee stress and pain. It provides a total body workout and options to go backward or forwards. Smaller bars are incorporated into the manufacturing in order to provide a resting position for users. The product is fairly compact and is not too heavy or bulky, so it takes up minimal room and doesn’t take too much effort to move around. Regular maintenance is needed on the trainer’s screws and bolts to prevent damage to the machine. The level of durability on the machine is questionable depending on the luck of the buyer. Foot pedals are on a slight incline, making it difficult for users to keep their feet on them without any slipping. The machine is known to run slightly choppily on higher tensions levels. Using the trainer can result in a bit of noise coming from the machine at higher tensions. The stride of the machine is smaller than average, making it difficult for people with larger strides to make use of it. The bicycle seat is slightly uncomfortable and can make working out a bit more difficult. It is not designed for heavy and high-intensity workouts and can become unsteady when used with too much action in mind. 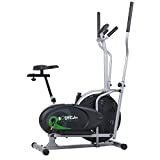 This imported steel elliptical machine is a 2-in-1 trainer that pairs bicycle-like exercise with the possibility of upright elliptical workouts. The trainer has a built-in micro-tension controller that provides a smooth, consistent, and easily adjustable magnetic resistance. It comes with a hand pulse monitoring system that notes your heartbeat, while the meter function also keeps track of your time, speed, distance, and calories burnt. The platforms are large to accommodate more body sizes and are anti-slip to prevent injury. Dynamic moving arms allow for a strong upper body workout along with the lower body exercises. The machine’s compact and carefully designed size make it easy to fit into remote corners of a room in areas with limited space. It is a naturally durable piece of equipment that doesn’t require too much maintenance. It has an extremely quiet operation and makes no noise during workouts. The machine will hold up relatively well, even underweight higher than its stated capacity. The product is sturdy and durable and will hold up well for a long time, even with daily exercises. The short stride length. may be uncomfortable for even those of average height. Moving faster can result in instability and wobbling. Larger or taller users may find the machine to be unsteady during use. Even higher settings do not provide the same intensity as a user may expect from that level, and as such, this machine is not designed for difficult workouts. The higher tension levels seem to be relatively similar in difficulty. Assembly instructions and parts can be confusing and may require two people for correct setup. 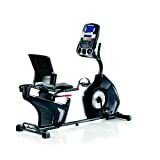 The lightweight design of the trainer can result in shifting and movement of the machine during higher intensity workouts. Pedals may not glide or move as easily as one would expect from professional gym equipment. The seat and handlebars are fully adjustable for a wide variety of comfort preferences and body sizes. The machine is driven by a smooth chain and a heavy-duty crank for reliability and a hitch-free workout. It is customizable even further with adjustable resistance and transport wheels to cater to all exercise needs. The product is well-built and durable, manufactured for sturdy function and long-lasting use. It is very stable, even during very intense workouts. Foot pedals have grips to hold onto feet and prevent slipping and injury. Easy assembly complete with simple-to-follow instructions. This machine can be said to be on par with higher priced bicycles and other trainers of a similar kind. It may be just as good as the equipment users may find in a professional gym. The product has a 90-day warranty. When adjusted to sit lower, the seat post may make clanking noises that could be distracting to users. The resistance and tension, while adjustable, can be inconsistent. At certain times, resistance can go from extremely easy to of very high difficulty without any balanced levels in between. In certain builds, the flywheel is noisy and can be annoying during exercise. There is no digital display on this machine, and as such, there is no progress tracking of any kind. The seat may be slightly uncomfortable for users due to its narrowness and its hard material. The flywheel needs periodical oiling in order to reduce squeakiness from the pedals. Despite the adjustability, smaller users may find the machine too large for their liking, as the handlebars cannot be adjusted in the forward and backward directions (only upwards and downwards). The machine is adjustable for a variety of heights and sizes. Handlebars provide a solid upper-body and arm workout. It arrives equipped with a total of fourteen workout apps for users to try out, and all are easy to navigate. Each program has been professionally designed by a certified personal trainer, and when combined with the use of an app, the machine will automatically adjust resistance and other necessary features. The machine has fourteen digital resistance levels in order to cater to a variety of exercise needs. This trainer has a built-in target pacer that can be set to a custom goal. An indicator will then inform users of their progress, encouraging them to quicken or relax their pace depending on their preset goals. An inertia enhanced flywheel allows for smoother workouts. The generous stride length allows for full and comfortable movements. A large LCD window displays all tracked progress, including stats from the dual-grip EKG heart rate monitor and RPM meter. A water bottle holder has been added to the trainer for convenience. The product comes with a 90 day parts and labor warranty. Whether the stride length is suitable is up for debate – some users may find it too short. Workouts can become noisy due to high squeaking noises, which may cause distractions or be annoying to many users. The computer monitor does not track distance traveled, which is unusual considering the fact that it tracks most other things and more. The pulse monitor does not always function as it is meant to, and at times may fail to record heart rates. The assembly can be a difficult process, especially when done by a just one person. The product is very heavy and may not be possible to move around easily. ProForm’s customer service leaves much to be desired. Progress tracking is extremely efficient with this machine. The LCD window system is dual-track and lets users monitor thirteen different forms of feedback. Following this, the Schwinn Connect system allows for goal tracking by letting users export data for maximum productivity and progress watching. Comes with several features, including a USB charging port and data exchange port, speakers, a holder for items, and a 3-speed fan. The machine comes equipped with a wealth of options, including 29 programs to choose from, four different user settings, and a whopping 25 resistance levels that allow for maximum customization. A high-speed inertia perimeter weighted flywheel keeps alignment, smoothness, and reliability in workouts. All exercise on this machine is quiet, and it is smooth and consistent throughout a workout. Pedals and straps are very sturdy and durable. Has a high value for the price and may be on par with some gym equipment. Poor packaging can lead to the necessity of returns or part replacement, which can be a hassle. The display panel has a distractingly high level of brightness that may be unsavory for some users. The seat can only be adjusted in certain directions and is not as versatile as other elliptical. High-intensity peddling may cause the machine to shake and shudder from side to side. The assembly can take a long period of time and may be difficult for one person to accomplish. Heart rate monitor is unreliable and may display inaccurate information. The in-built fan is slightly weak for some users and may give off a plastic smell in the beginning of usage. The seat may be uncomfortable. If the assembly is not 100% accurate, the machine may become noisy. Schwinn customer service is difficult to get through to. There are 22 built-in customizable workout and exercise programs: 9 profile, 8 heart rate controlled, 2 user profiles, 2 fitness test and Quickstart. The machine is highly customizable with 20 varying resistance levels and six different incline positions so users can get the exact workout they need. The stride lengths allow for users of many heights and sizes to use the machine seamlessly, and the footpads are large and cushioned for comfortable use. The frame consists of two center supports and two integrated levelers, accompanied by oversized crossbar tubing for solid, durable, and stable use. Fitness data and statistics from exercise sessions can be exported to either Nautilus Connect or My Fitness Pal. A dual track LCD display can show statistics of 13 work out details, including a grip-based heart monitor. The product comes with several features, including acoustically chambered speakers with an MP3 port, a USB charger, a media shelf for books or tablets, an adjustable fan, and transport wheels for easy transport and movement. Provides stress-free, low impact workouts that do not negative effect joints. Motion handles provide a good arm and upper body workout for added cardiovascular movement. The high-speed, high-inertia drive system coupled with a perimeter-weighted flywheel guarantee a smooth and gliding workout that stays silent. This machine comes with a manufacturer’s warranty that includes 10 years for the frame, 2 years for mechanics, 1 year for electrical components, and 90 days for labor. Regular maintenance is required to prevent squeaking and keep the machine is good working condition. The food pedals on the trainer are on a slight incline, which can be uncomfortable for users. The hex rubber used in the manufacturing of the foot pedals can cause discomfort. The resistance provided by the variety of levels are more difficult when compared to professional gym equipment. Syncing to My Fitness Pal can be a tedious process. The tracking functions can be difficult to configure and may result in incorrect data regarding distance, time, speed, and calories burned. 22 fitness programs are available for use with 2 user settings. The trainer comes with 20 levels of resistance for all skill levels. A solid and durable build promise a long-lasting product that won’t let users down. A high-speed, high-inertia perimeter weighted flywheel promises extremely quiet and smooth exercise sessions. The product comes with 13 varying feedback statistics that are displayed on a pair of dual track LCD windows. A charging USB port and data exchange allow for easy data uploading to Schwinn Connect, and progress can then be synced to My Fitness Pal. There is an item holder for books, magazines, or a tablet, and other features include a 3-speed fan, an audio port, and speakers. The heart rate monitor function works accurately. Excellent value for money; the machine runs at a high quality that is comparable to professional gym equipment. Professional and efficient customer service are ready to help users that have problems or require assistance. Foot pedals have a slight incline that may result in user slipping forward onto their toes, and they do not have a strong grip on feet. The display monitors have a low brightness that makes them difficult to see during exercise. The positioning of the tablet/magazine holder can get in the way of one of the screens. Calorie and distance trackers are not entirely accurate. If users prefer not to use the mobile handlebars, they may find that the bars hit them as they move or make it difficult for them to reach out and access features of the machine. The built-in fan becomes loud at higher speeds. Regular maintenance and lubrication is required in order to prevent damage to the machine. For fluid and silent workouts, the trainer has a 25 lbs flywheel and high gear ration for natural-feeling motion, both forward and backward. Four rear wheels on heavy-duty rails promise higher stability and reduce wobbling. The machine arrives with six standard exercise apps and two custom programs for a more effective workout. Two heart rate programs are available, monitored via pulse grips and a chest strap. There are 20 levels of resistance to choose from for different levels of workout difficulty, as well as different power incline positions adjustable between 0 to 30 degrees. A backlit console with LCD display is easy to view as it tracks statistics and data completely accurately. The machine comes with adjustable pedals, console, and stride. Features include a fan, sound system, and water bottle holder. 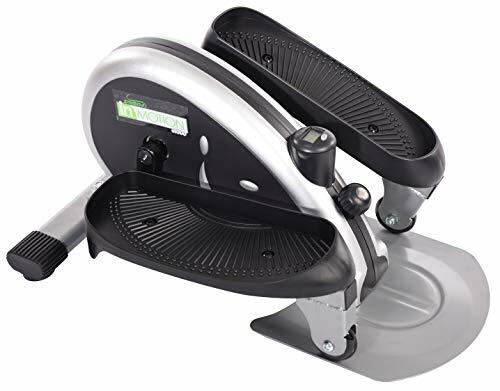 The foot pedals on the machine are comfortable, adjustable and made oversized for larger users and come with a 2-degree inward cant to take stress off of ankles and knees. They were also designed by a leading physical therapist for maximum health and comfort. It is of professional gym quality and standards. It comes with an excellent manufacturer’s warranty that encompasses a lifetime warranty on the machine’s frame, five years on electronics and parts, and two years on labor. This is the most expensive of the products in this list by a wide margin of over $1,000. Complicated assembly instructions and a long process of putting the machine together can be discouraging for users. Rust may begin to develop after a few years of use, so the machine needs regular maintenance. In addition, tightening of screws and bolts must be done regularly to counteract loosening. Resistance levels appear to be weaker than expected of an average elliptical machine, so users may need to use higher resistances from the start. There are no heart rate monitors on the moving handlebars, meaning that users who wish to use the pulse monitors have to skip upper body training. The extremely heavy design makes it difficult to move around if needed. 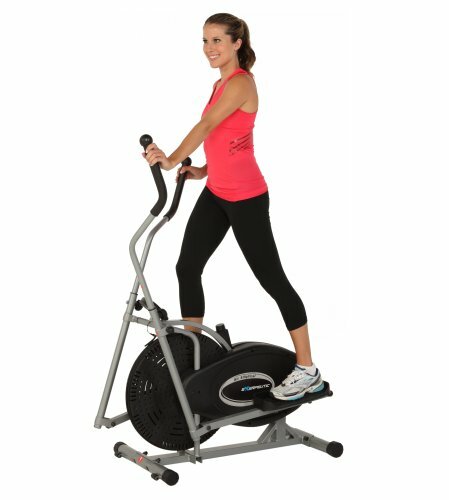 So, what do we think is the best elliptical machine in each category? 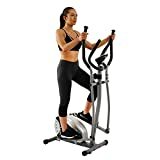 In the low budget category of under $100, the Stamina In-Motion Elliptical Trainer offers a unique workout experience that makes it extremely easy to use under any conditions. Unlike all the other options, it offers an extremely versatile workout that can be done anywhere. In the under $200 section, the Exerpeutic Folding Magnetic Upright Bike definitely stands out. It has more customizable features than its competitors and is one of the few low-budget machines which also monitors heart rate, which is a great feature to achieve at this price point. 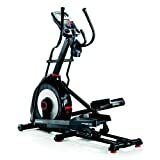 Moving on to the under $500 section, the recommended elliptical machine would be the Schwinn 270 Recumbent Bike. It comes with so many customization options and is known to run more quietly and much smoother than its counterparts, and its durability is impressive. Finally, in the high-end over $500 section, the Sole Fitness E35 Elliptical Machine might be the most expensive of its options, but users will receive exactly what they paid for: a gym-quality trainer that has a wealth of customization, tons of adjustable areas, multiple additional features and very few drawbacks at all. Hopefully, this has helped you choose the right elliptical machine for you! Elliptical machines are, essentially, indoor workout equipment that mimics outdoor exercise, while keeping users within the same space during sessions. It can be a great step forward for users with limited space, time, unfavorable outdoor terrain, or a lack of easy access to a gym, and these machines or trainers have been known to promote excellent results. With that being said, purchasing a machine that works perfectly for a user’s needs can be a difficult task when you’re on a budget, with many machines posing more problems than solutions. As such, it’s important to know what to look for and what to expect out of an elliptical machine before purchasing. It’s often extremely important for users to be able to record their progress in order to get more out of their workouts and see how far they’ve come. It’s good for motivation and helps users to set achievable goals. As such, all elliptical machines should come with some way to track progress. When purchasing, a user should consider what data the machine notes down. Times, speed, distance, and calories burned should be a part of that mix, while other features like a heart rate monitor can be useful too. Many machines fall into the trap of not providing completely accurate measurements and data. This may not be easy to avoid when you’re on a budget, so it’s vital that it’s noted what does and does not work. Heart rate monitors can be bought separately to make up for a faulty one on the trainer, and there are many programs to track calorie loss if the machine’s program doesn’t add up right. In addition, some machines may offer features that allow progress to be synced to an application or system. This can be extra helpful for users who are using a fitness application or website. Every individual user has unique needs and requirements from an elliptical machine, so it’s important that customization is a possibility. The first problem comes from varying heights; users of above and below average heights may need to take note of whether the seat and handlebars on a machine can be adjusted. If not everything can be adjusted, then users will have to take size and stride length into consideration when purchasing. A machine should also come with different resistance levels, regardless of the price point, in order for users to choose the difficulty of workouts, starting small and progressing as time goes on. An added bonus comes in for trainers that also provide a variation of incline levels for more elliptical workouts. Some higher-end machines might come with fitness apps and programs built into the console system to help users on their fitness journeys and may have more than one user profile so that two or more people can use the machine in ways tailored to their preferences. These features are great to have along in any product and can really aid progress. This goes without saying, but an elliptical machine should last for a period of time that matches up with its price point. Parts should not break easily, and should all be made of a sturdy material. Warranties should be reasonable and cover many aspects of the machine. In terms of what to look for, a good machine will not wobble or become unsteady, regardless of a user’s pace or the difficulty of their workout. There should be minimal squeaking or noise coming from the machine as well, as this is not only an indication of loose parts but can be distracting for users. Some trainers may require regular lubrication or tighten in order to remain in good working order; too much maintenance needs can be a hassle. Pick a machine that works best within your personal knowledge of mechanics to avoid frustration later on! Any added features on an elliptical machine are a value for money bonus. Water bottle holders, shelves for tablets or books, charging ports, sound systems, and fans are some of the options available. Users who have something specific in mind for their workouts may find it useful to search for machines that only have specific features. An elliptical machine is equipped with all the features a serious weight watcher needs to succeed in his exercise program. This manually-operated machine mimics the motion of cross-country skiing. Users can place their feet in its elliptical pedals in order to glide their feet back and forth in a rhythmic fashion. Elliptical machines also have wireless heart rate monitors and built-in timers. Their heart-rate monitors are used to read your heart and pulse rate as you exercise the lower and upper body. The internal motors can be controlled in order to adjust the pedals. By raising or lowering the pedals, You can gradually increase the intensity of your workouts and get better results from the exercise programs. Lastly, these trainers have varied controls for adjusting the intensity of the workout. With flexible controls, you can stay motivated all throughout your entire fitness plan. Elliptical trainers are also known for their capacity to assist users as they work on various muscle groups. Unlike treadmills, an elliptical machine can reduce the stress and strain applied to the user's joints. Their smooth and fluid motion also provides users with the chance to strengthen the muscles in their glutes, calves, arms, shoulders, and back without straining any of their joints. These machines mimic the natural motion of the ankle and hip joints while jogging, walking, or running. They allow you to position your body at the center of the drive wheels. This makes it more all throughout your elliptical workout. The upper handles can also be pushed and pulled, simulating a skiing motion. This allows your heart rate to rise quicker, hence decreasing the total amount of exercise time needed. An elliptical machine will allow you to perform an upper and lower body workout at the same time. This will enable you to build more muscle density all throughout your body while efficiently burning more calories. As you use up more energy for exercising both the lower and upper body, you can burn more calories and increase your cardiovascular capacity within shorter periods of time. Its dual action process will also reduce the amount of time you need to spend on your workouts. You can burn more body fat during a 20 to 30-minute elliptical workout than a 45-minute aerobic exercise. These are only some of the benefits of using an elliptical trainer. With all these benefits combined, elliptical machines deserve to be recognized as the most effective equipment for losing weight fast. Elliptical trainers are growing in popularity. The number of trainers present in gyms and homes testifies to the fact that these popular exercise machines appeal to a broad range of consumers. However, when choosing a machine to go into your own home; what counts are the features that matter to you. That means that not all elliptical machines reviews will even apply to your needs. This article may assist you in prioritizing reviews and choosing the features that matter to you. While a well-known and respected brand name may not be an absolute guarantee that nothing will go wrong with the machine. Purchasing from a well known established manufacturer can certainly assure the consumer that if something does go wrong with the machine, the manufacturer will still be there tomorrow and a year from now. A company with a history of making a quality product and of providing service for their machines is a better choice for most people. What's Key in an Elliptical Machine? The stride length of the machine may be crucial. One reason elliptical machines are popular is the low impact and smooth stride they provide. They can be easier on the heels and joints than even treadmills. However if low impact and smooth even strides are important to your personal elliptical machine reviews then ensure that the stride length fits your body, stride lengths can vary from fourteen to twenty-two inches. A short stride can negate one of the prime benefits of the elliptical trainer. Apartments, basements, and garages can be very sound sensitive areas. Elliptical machines that are excessively noisy can be too annoying to use. The console and display can matter a lot to the user who pays close attention to their optimum heart rate and who values ease of use. A variety of workouts may keep the machine interesting to use and can be crucial for the consumer who values variety in their routines to keep them fresh and challenging. Almost everyone has a different workout schedule, environment and routine in mind when they purchase an elliptical machine. Some machines come with all the extra features and few of the essentials. However, an elliptical trainer with an articulating foot pedal may not be essential to a user but can be important when it is included in a model with all the other features the consumer considers important. An elliptical machine with too many extras but lacking essentials such as low noise, an even stride or a variety of workout routines may be pretty, but useless for consistent training. The features that are important to the athlete in training may be different from that of the professional who trains three times a week. Elliptical machine reviews are personal and the average consumer should compare the reviewer’s opinions against their own intentions for the machine. With everyone trying to become healthier and fit these days, exercise equipment is becoming a bigger business than it has before. That is because most people starting an exercise routine find that using a piece of equipment that they paid with their hard earned money motivates them to at least get started on doing some kind of exercise. However, for many people choosing the right exercise equipment is difficult. If you are looking for the right piece of workout equipment you might want to consider some elliptical machine benefits. One of the most important elliptical machine benefits is that this it can be geared to your fitness level. This means whether you are a long time couch potato whose sole exercise in the last few years has been a few trips to the refrigerator or a 20 something that has been running half marathons you can get a good workout from this machine. For those who haven’t exercised for a while using this machine for a few minutes each day at a slow pace will start to help you build stamina. Keep in mind that you are not going to want to do a ten minute run on the machine your first week of owning it, you are simply going to use it to start getting your blood pumping and your legs to stop feeling like jello. Once you do that you can start increasing your exercise time and speed to become more and fitter. Another one of the elliptical machine benefits is that it is an extremely low impact. This machine duplicates the natural movements of the joints in your ankles, knees and hips just like walking does without the vibration caused by the impact of your feet hitting the sidewalk or ground. This makes this machine ideal for both the young and the not so young as it saves wear and tear on those important joints. This machine is also ideal for older people as it actually helps to build bone density. The weight bearing exercise you get using this machine can help prevent or arrest the onset of osteoporosis by actually building stronger bones. Unlike some machines that work one or two areas of your body, the elliptical machine benefits the entire body by giving you a complete workout. This means that not only will you be fitter overall and get a great cardiovascular workout but, if you are using this machine to help take off a few extras pounds it will do so easily as working your whole body at once means you are burning more calories at once. Add to that the fact that while you are burning off those calories this machine is also helping you tone your body. This makes this machine great for losing weight and getting more fit at one and the same time. This machine is also extremely easy to use. It starts when you start and stops when you stop, You make it go faster or slower and can change speeds at any time without the need to push any buttons or make any adjustments. Since elliptical machines have no belts or motors they are also low maintenance as well. The elliptical machine benefits are many and varied making them a great machine for those who want a machine to help them become more healthy and fit. Cheap Elliptical Machines: Deal or No Deal? Close to everyone has heard the saying that you get what you pay for. In general, this is one of the truest sayings that you will ever hear. This belief is no different when it comes to buying cheap elliptical machines. Typically, elliptical machines run anywhere from a few hundred to a few thousand dollars. Generally, the amount of cash that you are willing to shell out will determine the type of quality that you get. As a rule, cheap elliptical machines are anything under $500. Very rarely people come across a great high-end elliptical around this price. Most of the better quality machines northwards of $1,000-$2,000 and well worth the price. To some, this is a large sum of money to pay for a fitness machine. Even so, keep in mind how it is an investment for your long-term fitness and health. Therefore, forego buying the cheapest elliptical machine, and opt for something that you find both affordable and practical. Ultimately, you want to buy a machine that you will want to use. In consideration, you are not going to want to buy something that is not going to perform well. Some of the largest problems with cheap elliptical machines are their durability. Largely, they are incapable of handling constant use. Over time, many of the cheaper elliptical machines will become unbalanced, no longer perform well, as well as potentially become dangerous to use. Usually, problems tend to take the form of loud noises and wobbling. Typically, people think they have made a great buy with cheap elliptical machines since the machine will usually perform great for the first few months. However, people quickly have to face the facts that they made a bad purchase after pieces start coming apart or breaking. This leads the person to stop using the machine for what they had initially purchased it for, which makes it so that it is worthless. In general, if you want a workout machine that is going to last then you are not going to want to buy cheap elliptical machines. On average, most of the cheaper machines tend to lack in performance and durability. Furthermore, although you may think you are getting a deal you are actually not. The best value is something that is going to last and that you are not going to have to replace for many years to come. Furthermore, it is important to keep in mind how even the more expensive machines require a level of maintenance. Normally, elliptical machines do have to be serviced at one point or another throughout their lifetime. However, with the cheap ellipticals, you are sure to require more servicing than you would otherwise. Eventually, this could lead to spending more than you would have initially, had you bought a machine that cost more. On the other hand, if you really cannot afford one of the more expensive machines at this time but are set on having one, then consider buying one of our recommended machines above as a transition to a more expensive machine. Should You Buy Used Elliptical Machines? It is no secret that one of the very best exercise devices you can exercise on would be an elliptical machine. Such a machine has the potential to hit every muscle of the body. An elliptical machine can help you burn fat, develop lean muscle mass, and enhance your cardiovascular conditioning. That is why so many people prefer the elliptical machine over scores of other cardio devices. So, why do so many people avoid purchasing them? The answer is found in one single word: cost. A device like this comes with a huge price tag…or does it? Actually, it is always possible to purchase a used elliptical machine. But, would this be a wise move to make? No one would deny such a fact. Even a mere cursory look at online venues that offer used equipment for sale reveal tremendous potential savings. For example, you may be able to save 30% to 50% off the original price. Does this mean you would only gain access to low quality used elliptical machine devices at such great savings? The answer to this is a resounding no. 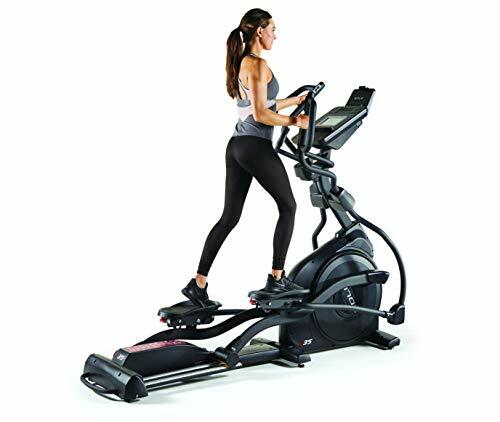 Some of the very best ellipticals in the industry are available at discount prices because they are previously and may be a few years old. This does not mean that there is anything wrong with the device. It is simply used and not worth its original manufacturer’s list price. This is not to say it is not a fine machine or one that cannot deliver a tremendous workout. A used elliptical machine that remains in excellent shape is assuredly one that can provide high-quality results. This is not to say, however, there is not anything you should be mindful of. One area of concern as far as a used elliptical machine is concerned would be the warranty. Or, rather, the issue of concern would be a lack of a warranty. Warranties are usually only good for one year unless an extended warranty has been purchased. Generally, when you purchase a used elliptical machine you will be purchasing a device without any warranty in place. With an older machine, you will potentially experience a breakdown in parts. No mechanical device is intended to last forever and parts do wear down. Buying used does put you in a situation where you may have to pay to replace parts or repair the system. That is just the nature of buying used. That said, the odds of a high-quality machine breaking down when it is less than five or six years old are aminute. Additionally, if you were to properly care for the machine, this would further reduce the potential for any problems to befall your used elliptical machine. Buying used can be the perfect course of action to take when you wish to save money on acquiring the best possible exercise device available. There are a lot of great benefits used elliptical machines can deliver. Never lose sight of this fact when you wish to get in great shape. Are Commercial Elliptical Machines Worth the Extra Expense? Commercial elliptical machines typically run in a higher price bracket than your standard residential elliptical trainer, but there are reasons for that. When you go with a commercial grade product you will have a machine designed to last for many years, even with very high rates of usage. Think of the activity level a machine gets in a fitness center or gym. That is the activity level that commercial elliptical machines are designed to withstand. There are of course other advantages to be found on specific commercial elliptical machines, but you will have to compare different manufacturers and models to see those specifics. The above-listed things are the general advantages that you will gain when you decide to purchase a commercial grade elliptical. If you could take a couple commercial elliptical machines apart and then take apart a residential model, you would find much stronger materials inside the commercial quality machines. They will use steel and very strong metals where plastic and other weaker materials are used in the residential model. You typically find much stronger, consistent motors when you purchase commercial elliptical machines. These are motors designed to keep going at a consistent power rate even after hours of consistent use. They aren’t going to make loud noises or slack in the pace in the middle of a great workout. They are going to keep up with you no matter how aggressive or long your workout may be. You can expect a commercial elliptical trainer to take up a bit more room than most residential elliptical trainers. Since they are designed for a fitness club or gym in mind, space saving models aren’t of primary concern when you get into this area of the market. It’s true that many residential models keep the amount of space required in mind, but you are shopping for a different beast when you bring home a commercial elliptical. Of course, some commercial elliptical machines will be smaller than others and some will have different features than others. There are also some residential models that now come with commercial grade motors. Those models will be higher priced than lower quality residential elliptical trainers, but they may be a bit lower than a full commercial grade elliptical. When deciding whether a commercial-grade elliptical is really worth the extra expense, you have to consider your fitness needs. How often will you use your elliptical? How many people will be using your elliptical? How long will your typical workout be? How long & often would you like to be working out in the future? The more intense your workouts will be and the more activity the machine will get, the more you will need to purchase a commercial elliptical machine. If you want to run and are heavier in body weight, then the weight limits and durability factor could push you toward a commercial machine as well. If you are interested in getting into shape for swimming season or just want to feel better overall you may be wondering how to find the best elliptical for home use. When you first start looking at machines you may be overwhelmed by the options available, prices and how to determine a better machine for you. Here are a few tips to get you started! When you are thinking about investing in your health, it is hard to put a price on it; however, your budget would beg to differ. You have to realistically calculate how much you can afford to spend on this piece of equipment. This will do two things, prevent you from suffering buyer’s remorse when the mortgage is late and narrow your research field. One of the best elliptical machines for home use in the $500 range is the Horizon EX-57 . This unit has great customer reviews, 8 electronic resistance levels, 18-inch stride length and a 275-pound capacity. This model is considered good for new users as well as seasoned athletes with it’s heavy-duty 14-pound flywheel and smooth quiet operations. If you are quite a bit taller than the average figures you may have to invest in machines that reach a 26-inch stride length, which could cost a bit more. A good option for many people is to choose a machine that is adjustable in this department! In your push to get in shape, do not forget to consider your living arrangements. These machines can get big and bulky which is fine if you have a full basement to house it in. However, if you are living in an apartment or space is merely limited, you should first measure the area you prefer for the elliptical machine. Manufacturers specifications on the best elliptical for home use will list the full-assembled size of the particular model you are considering. Every exercise machine will have a maximum weight limit and you should consider this as well. Most will be rated for 275 pounds, but you can find units that will withstand heavier weights. One thing to keep in mind about this figure is where you are currently if you are at the maximum weight of a given machine it might be a good idea to choose the next model up instead of running the machine at maximum weight constantly. Not all ellipticals are created equal and the best elliptical machine for home use will have a decent parts warranty at least. When you have narrowed your list down to two or three options check the specifications for these numbers. This will make it easier to choose should you be looking at several comparable models. There are a number of reasons why an elliptical trainer is popular among those wishing to get in shape. Such devices work the entire body and have the potential to get you in shape quite quickly. In fact, the potential for an elliptical trainer to strengthen the heart is also quite significant. And, of course, people invest a great deal of time on the device because the volume of elliptical calories burned is significant. You will drop weight and possibly even get ripped to shreds when exercising on an elliptical. So, when it comes to the subject of calories burned on elliptical devices, how can you determine the sheer volume of calories burned? There are a few ways and they all deserve a look if you are hoping to use this device to get into top shape. The number of elliptical calories burned will depend upon the difficulty level of the workout, the duration of the workout, and added intensity you employ. Your age and your current weight will also factor into the equation. Gender fits into the mix as well. This is why it can be difficult to offer a generalized notion of what constitutes a uniform amount of elliptical calories burned. In terms of the “difficulty level,” all elliptical trainers will come with an adjustment where you can increase the tension and resistance on the device. Different ellipticals will come with different degrees of resistance but 1 – 15 would be among the most common. The level of resistance will cause your muscles to work a lot harder which means you will burn more calories than you would at a lighter resistance level. The duration in which you work out in relation to calories burned on an elliptical is rather easy to understand. The longer you workout on the device, the more calories you burn. Well, there is an exception we will get to later…. Intensity level can refer to the pace you keep on the treadmill. Do you wish to go slow, fast, or extremely fast? You can do any pace you wish since an elliptical allows you to move your arms and legs at the pace you wish without restriction. Now, this brings forth the notion that you can burn more calories at a shorter duration than you would with a longer one provided the shorter duration is at a much higher intensity level. This is not an easy way to work out on an elliptical device and no one new to cardio fitness should start at such a rate. However, it can be reached relatively quickly if you are willing to be consistent with your workout sessions and expand your cardio and endurance. Cardio and endurance can always be built on. The greater you expand them then the more elliptical calories burned can be attained. What is an Elliptical Cross Trainer? If you have fitness goals that you are determined to make, you need an elliptical cross trainer in your home. With this one simple purchase, you can increase your chances of losing weight and keeping it off long term. You can increase your chances of being healthier and in better cardiovascular shape one year from now as well. A cross trainer machine is much easier on your joints and muscles than a treadmill or exercising outdoors on the ground. Yet, it allows you to work up a sweat and increase your heart rate so you lose weight, challenge your muscles, and tone up. Here are some tips for getting the most out of your machine. You will make faster progress toward your goals if you set a schedule in writing and stick to it no matter what. Make a pact with yourself that you will make time for yourself and you will not cancel those workout appointments unless you are on your death bed or are physically prevented from stepping on the machine. You won’t get anywhere without consistency; regardless of what type of exercise machine you end up using. Set realistic goals so you don’t set yourself up for disappointment right from the start. An elliptical cross trainer can get you in shape and it can happen quickly if you are consistent and give every workout your all. Yet, you aren’t likely to drop twenty pounds in three weeks no matter how hard you work. Keep the goals realistic but challenging. If you fall short, don’t blame it on your cross trainer machine. Look at where you fell short and change it the next time around. Elliptical trainers come with a variety of resistance settings for a very good reason. When one setting becomes a bit easy or you stop breaking a sweat, it’s time to move the resistance up so the workouts remain challenging. If you use the preprogrammed workouts that are on your console you will automatically shift between resistance levels throughout your workouts. This will teach you how to do it for yourself if you want to later down the road. Spend some time doing intervals if you really want to see faster results. This simply means you rotate between a very hard resistance level and one that isn’t quite so strenuous. You should adjust your speed depending on how difficult each interval is. The first thing you should do when your cross trainer machine arrives is look over all of your features. Then get on the machine and try every single one of those features out. Even if you don’t think you will use it very often, you should know how to operate every single feature. If you have wireless heart rate control on your elliptical cross trainer, count yourself lucky and use it. that is the best way to ensure every moment of every workout is as effective as possible. Preprogrammed workouts are built into your cross trainer machine for a reason. Don’t do the same workout over and over until you get bored and hate the elliptical cross trainer. Do a different workout all the time so none of them get dull. 1. Reduced tensi[inson and force on your joints and muscles. An elliptical cross trainer benefits your joints and muscles because your feet remain firmly on the pedals. When you jog or walk outdoors there is a constant pounding on your joints and muscles as your feet lift up and pound down on the ground. An elliptical trainer keeps your feet on the pedals, which smoothly glide beneath the body. This means you have much less chance of injuring your body and you can workout for longer periods of time in greater comfort. It also means those recovering from injury in the lower body can use an elliptical with more comfort than they could use a treadmill. This is called low impact. What this doesn’t mean is that you won’t feel your workout the next day. You still really challenge the muscles and can get sore as your body breaks down muscle and builds it back up stronger. You just won’t feel that pounding pressure while working out. 2. Strength training potential and efficient cardio in one workout. 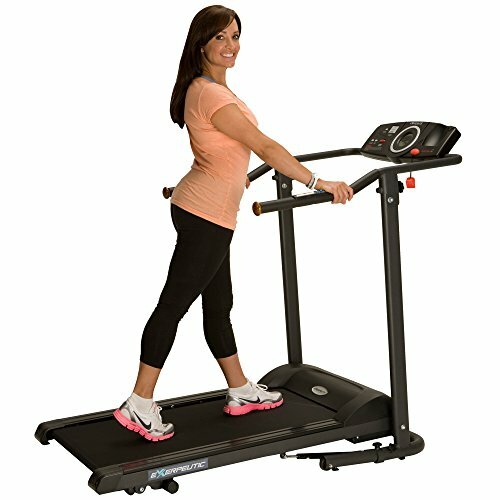 When you walk on a treadmill you may work your leg muscles some, but you don’t have the option of targeting specific muscles in the lower body for toning. A cross trainer benefits your shape and weight loss goals while allowing you to strengthen and tone lower body muscles while burning calories at an efficient rate. 3. You get a whole body workout and a higher calorie burn. Most treadmills and exercise bikes only work your lower body while your upper body remains stable or for support and balance only. You can pump your arms at your sides while walking on a treadmill, but that is not nearly as efficient as using the moving arm handles on an elliptical cross trainer. Can tone your entire body by working your arms, legs and core muscles all at the same time. This increases your overall calorie burn so every workout is a lot more effective. 4. You can pedal forward and backward to keep your muscles guessing. Have you ever tried to walk backward on a treadmill? It can be very tricky and there is a huge risk of falling and injuring yourself. This highlights one of the best ways a cross trainer benefits your body. You can pedal forward and backward without turning your entire body around. This allows you to target different muscle groups and shake up your workouts so you don’t get bored. The best part is you do all of that without risking injury! 5. Affordable prices for features that make every workout more effective and tons more fun. You can get features like iFit Live and wireless heart rate monitoring built into your elliptical trainer for very reasonable prices today. You never have to walk or jog in boredom when you are racing with your Facebook friends in real time through iFit Live or completing a grueling Jillian Michaels workout through the standard iFit technology. You don’t have to pay a ton of money to get features like these on your elliptical trainer. There are some very affordable models under or right at the $1,000 price mark that offer a lot of these advanced features. Elliptical trainers are among the most popular home fitness machines on the market right now. They protect the joints and muscles by limiting the impact that is felt while exercising on the hard ground, yet they allow you to run or walk so your fitness goals are achievable. For those with limited space in their homes, a folding elliptical trainer offers some clear advantages. A folding cross trainer will take up a lot less space when in use than a standard elliptical trainer. Most lower priced models selling for less than $1,000 will have a folding elliptical design while the higher priced models tend to be larger and much heavier without a folding design. If you have limited space in your home or would like to put your elliptical trainer in a home gym without crowding out other equipment, a foldable elliptical is the best way to go. When it is unfolded it will typically have a more compact design that takes up less space than a full-sized, non-folding elliptical. This is the biggest perk of using a folding cross trainer. When you are not using the machine you can simply fold it up into a more compact form that can be pushed into a corner, against a wall or perhaps put into a room for storage. This is not possible with a larger, heaving elliptical that does not fold into the more compact form. For the most part, you get a lighter frame that is much easier to move around when you purchase a foldaway elliptical. Most will come with wheels that make it even easier to get the machine from one room of your home to another. If you want to workout in different areas of your home on different occasions or just want something that can easily be moved out of the way to clean the floor underneath, a folding elliptical is a great option. It can be quite difficult to move the larger, more substantial models that do not fold. Just keep in mind that there are some trade-offs when you purchase a lighter weight folding cross trainer. They may have a lower user weight capacity than a heavier elliptical trainer. That is just the nature of the lighter frame which won’t be as strong as the heavier elliptical frames. Is a Folding Elliptical Right for You? You have very limited space to give up for home fitness equipment. You want to pack in a lot of different machines and need all the space you can conserve. You need to move your elliptical from room to room on a routine basis. You need something that can be stored out of the way when it is not being used. You don’t want a large elliptical that is obvious in your home décor. You want something smaller which doesn’t stand out. 16 resistance levels and an 18-inch stride are very competitive features within this price range. What is well beyond competitive is the 20 pre-programmed workout options. These options include the heart rate controlled programs which will be mentioned in the advanced features section below, but just having this many workout options already in the console is far from standard in this price range. This is important for users who need a larger variety of workouts to keep boredom from setting in. The reading ledge and built-in fan are also standard features often offered as conveniences on lower and middle-priced elliptical trainers. The only thing missing from this machine that some users will miss is a connection for a mp3 player and built-in speaker system. The console is on the smaller side, though it is well lit in blue and does deliver all the basic feedback on workouts. 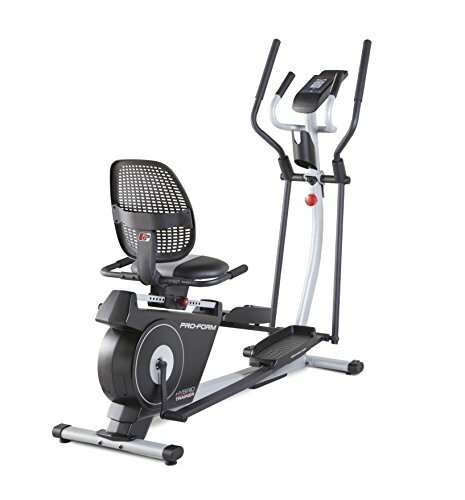 The Horizon Fitness EX-59 Elliptical Trainer helps you to bring the gym to your home. It features an overlapping pedal motion, and stress is completely eliminated from back and hips. This elliptical trainer’s footpath mimics natural walking or running motion that helps to minimize fatigue. 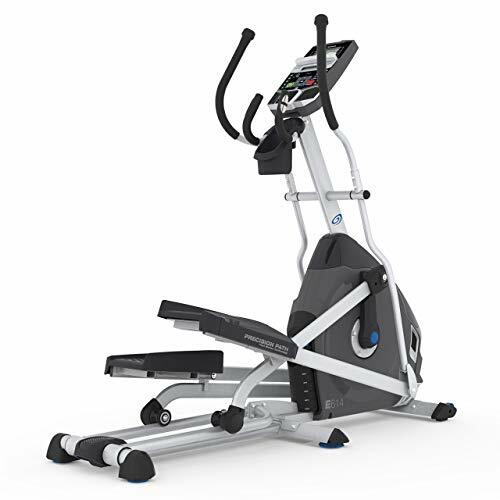 The Horizon Fitness EX-59 offers 10 different programming options. Three are target programs and three are workout programs including reverse train, weight loss, and hills. There is one additional custom workout that adds intensity and variety to your workout. With the Horizon Fitness EX-59 Elliptical Trainer, you can also mix it up at any time to provide a new workout experience. In addition to two quality sound speakers, the console includes an MP3 input for playing your favorite workout music and a headphone output for privacy. It also features three LED display windows that help to track calories, distance, and time. We found Amazon.com to have excellent prices on the Horizon Fitness EX-59 Elliptical Trainer and also on other elliptical trainers.